This Chuck allows you to quickly and easily change accessory bits on your Dremel tools without changing collets. 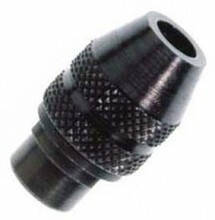  It will accept all accessory bits with 1/32" to 1/8" shanks. Click the button below to add the Dremel 3 Jaw Chuck #4486 to your wish list.